Snow over Lisbon 52 years latter! It took more than half century to snow over Lisbon one more time... but it did yesterday! 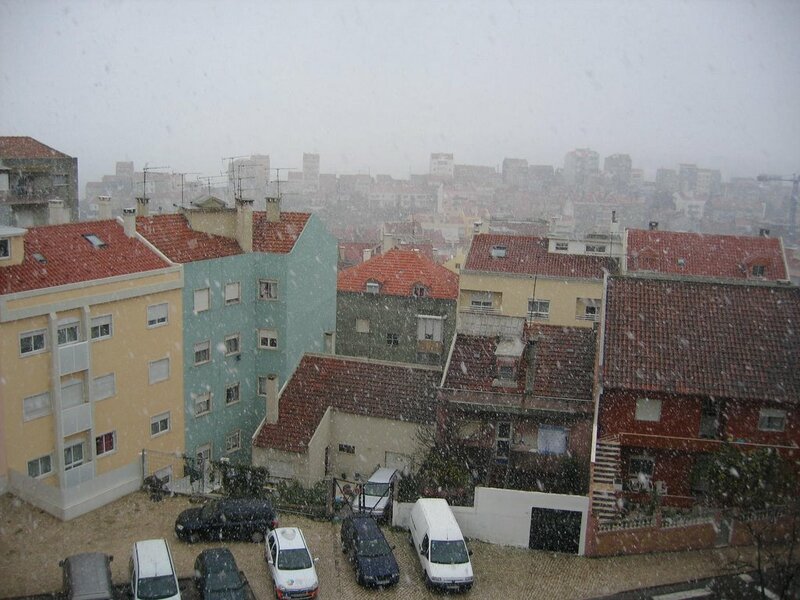 It was around 3 p.m. when the temperature reached its minimum turning inside out weather services previsions and a blanket of snow covered the city of Lisbon. This phenomenon wasn’t observed in Lisbon since 1954! Although it didn’t last more than one hour and wasn’t enough to cover in blank the capital roads it has surely made history. One interesting Strange Phenomena(Introducing Kate Bush) too was… people started calling and messaging friends and family about causing that sms and phone calls rate also made history increasing more than 42% for a regular Sunday! When you truly believe that you already saw every single stupid but profitable business branch you find this! Nowadays besides being able to buy your own funeral, choose your coffin model… you can leave a message, an email message! They claim on the service that you will be able to update from anywhere, I wonder what about if we want to update it after we’ve gone? Coming next! Don’t miss it! You might be wondering why yesterday I shot "Human Behavior" Björk's lyrics. For the very simple reason that yesterday more than ever I realized that I'm unable to understand some people's behavior. People that can’t decide themselves and keep contradicting in every single decision they make. People that can’t take the heaviness of responsibility although they are quite old enough for it. People whose life is empty but can’t get out of it because they fell comfortable on their hole. Do you remember Mikado Game? 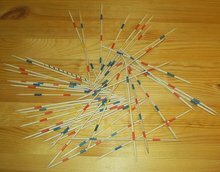 I used to play it a lot when I was a child… sweet memories… This was a very simple game of physical skill (and mental as well) in which sticks have to be removed from a pile without disturbing the remaining ones. Nowadays kids surely can’t play this game anymore, why? Notice, what are we talking about nothing else but a box full of dangerous sharpened sticks! What can happen? Nonless that at the end some kid will end up blind or something like that! Honestly I believe that kids from the 70-80 generation truly have good chances of living past 100 years old, why? Because we “played with danger”, our body and mind got used to the worst dangerous things like sharpened sticks! And offered by our parents themselves with no mercy! After Beetlejuice, the best I ever saw on Tim Burton peculiar humor on marriage between death and alive. Is it to Late for IPT? No it’s not, if your baby is still less than 30 months old you can still give it a try, with some modifications accordingly. Take a look at Infant Potty Training and learn how to. Today, when surfing the net I found out something already heard about but never took deeper look into: Infant Potty Training. For those that believe that nature does everything correctly, and if babies don’t carry any diapers when they’re born there must be some reason. According to Zelia (I’m sorry this one is in Portuguese… and many other parents following this method, Babies are smarter than we think! The big mistake that people make is to presume that a newborn baby is unaware of going to the toilet. We assume an infant is incapable of toilet learning since infants are small and uncoordinated and also because they cannot walk or talk. If you have a new born, give a try.